Donald Trump was elected president a year ago today and we wanted to see what people are thinking 365 days later. CHICAGO -- A year ago Wednesday, Donald Trump went from real estate mogul to President-Elect of the United States. Policy proposals dubbed campaign rhetoric ceased to be rallying cries as Trump found himself in a position to enact his agenda. 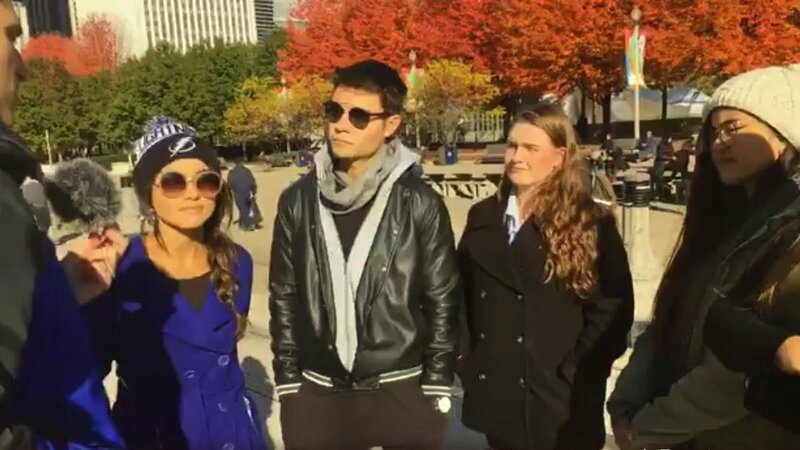 After a whirlwind year, we still find ourselves talking about the 2016 election and now-President Trump's victory; to mark the occasion, we ventured into Millennium Park to see who would talk with us and what they would say about 45 now that he's been in office for close to a year. It was not easy to coax people into a conversation on-camera. In fact, many seemed to have strong opinions, but declined to express those publicly. The first people willing to chat were a pair of men from Mexico with a powerful comment: they think a border wall might be good to keep Americans' hatred out of their country. Next we spoke with a group of Florida college students. For some, the 2016 election sparked a political awakening and led to more engagement with the national discourse. Overall, the group felt their campus community has withstood political difference in the face of pressing matters, like white supremacy, in their community. You can watch our full conversation below.